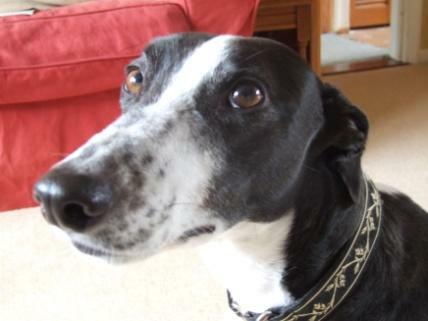 Our lovely Luna, an ex racing 4 year old Greyhound, arrived at DAWG from Ireland in 2012 quite a timid, quiet girl. My daughters and I met her in June 2012 while she was being fostered in Bristol. I remember when I first met her at her foster home she came straight over and rested her head on my lap - I was smitten. Of course I?ve since learned that she?s a bit of a tart and actually enjoys attention wherever she can find it! DAWG trustees and Foster family did a great job of picking us for Luna (yes I did get that around the right way around didn?t I Gerry! ); learning what our lifestyles were like and what sort of people my daughters and I were. Luna has fitted right in and we?ll never look back. From foster she was already house trained and perfect on the lead, we knew her only remaining major issue was busy roads. Luna has been part of the family now for just over a year and what a gorgeous loving; gentle; cheeky; lazy; and, occasionally, loony lady she is. She has even conquered her traffic phobia, happily popping along to see a recent motor bike trial! Luna loves meeting up with all her two and four legged friends at DAWG. Although she hates water, she can?t wait to stretch those long legs on another visit to the beach soon. Now officially registered as a PAT Dog (Pets As Therapy) she will soon be lapping up the attention at hospitals, schools, nursing homes etc and I hope bringing joy to many more people.